With „Automated Microwave Hybrid Assembly" Tesat owns the capability to manufacture complex highly integrated LTCC microwave modules within the frequency range 2...77GHz in man-less ghost-shifts over night and at very high volume. These services are offered to internal and external customers. The facility covers a clean room area of 300sqm (ISO class 8). A workforce of 7 highly experienced engineers and technicians provides an annual capacity of about 2.1 million microwave placements. The available LTCC multilayer technology is the key technology to introduce high frequency system in package (RF-SiP) for future space applications. This reduces size, weight and cost of next generation satellite microwave modules significantly. Existing production capabilities are also ideally suited for high volume production of T/R-modules in X-band radar applications. 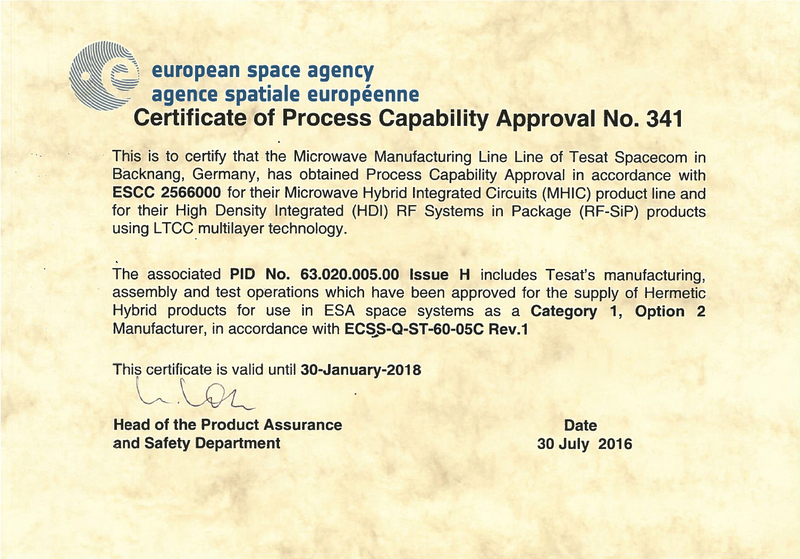 For high density integrated RF-SiPs using LTCC multilayer technology, TESAT holds a valid ESA certificate according to ESCC 2566000. Major tasks and responsibilities of the team are rapid prototyping, industrial engineering, development of assembly- & test-processes, development of advanced manufacturing technologies and last but not least the high volume series production. Highly experienced microwave R&D and hybrid assembly experts are conditioning new microwave designs in terms of highest "Design for Manufacturing" (DFM) and "Design for Test" (DFT) levels. This is performed in closed co-operation with the customers microwave R&D engineers beginning on schematic level. By consequent reduction of process variety to the very minimum and development of robust assembly processes like plasma-cleaning, epoxy dispense, pick & place, eutectic die attach, wire-bonding, automatic optical inspection and electrical test, the products are ideally industrialized and finally suited for automated series production. The extremely high process stability realized by this way of working is the supposition for high First Pass Yields (FPY) and volume on one side, but for TESAT the decisive point is to satisfy highest quality requirements in space projects with low volume. Existing production experience is 67,000 highly integrated TRX-RF-modules using LTCC-multilayer-technology and includes attach of roughly 890,000 GaAs-MMICs. This volume has been manufactured at a FPY >90%. Latest process development steps promise a stable FPY >95%.